On day 2, let’s visit Arunachal Pradesh! The place where the first rays of the sun falls. Arunachal Pradesh ‘Arun’ meaning sun Pradesh means country. Also known as the’ Land of Dawn Lit Mountains’, it’s also known as ‘Land Of The Rising Sun’. Apart from these there are names like ‘Orchid State of India’ and the ‘Paradise of the Botanists’. For those of you who have missed what the Blogging Marathon is about then yesterday we visited Andhra Pardesh! Arunachal Pradesh of today was known as North East Frontier Agency (NEFA) during the British rule. This area is inhabited by the locals called Mishmis there are further division of their tribes. The area is continuous with Tibet in the north, India towards west and south and Burma on the east. It is therefore, but natural that people from India, Tibet and Burma also throng into NEFA, especially after the Chinese invasion of 1962. The concept of a village is quite different from that in other areas. It denotes a cluster of a few huts either on top of a hill, on the slope of the mighty Himalayan ranges or in the valley near the turbulent tributaries of the mighty Brahmaputra. Some of the peculiarities of the area are – cut off from the rest of the country, you have to walk for three to four days, absence of city luxuries, rich in Flora and Fauna, almost all kinds of birds as in the birds sanctuary, fast flowing cool waters of the rivers, simple living in thatched huts, biting cold in the snow season, cooperative living among Armed Personnel, Civilians and locals and among all the highest morale of the people in the danger of another Chinese onslaught as in October 1962. We were posted to the forward area close to the Chinese border. The signs of the October ’62 invasion and subsequent Chinese threats were still fresh in the minds of the people. The belief was that the Chinese were still in an advantageous position to invade, occupy and run over the place anytime they decided. (Now of course we have improved our side and would allow China or any other enemy to easily run over us and defeat us as in ’62). It was our job as part of the Intelligence Bureau to collect intelligence and alert the Armed Forces in the forward areas in case of an attack. Not an easy task as the army was 60 kms. away and not connected by roads. It was against this background one winter evening when we were engaged in playing cards, when we heard the sound of a bomb exploding! Very near us!! c) Accidental setting off of a bomb. We, l the officers of the Armed Forces like Assam Rifles, ITBP and us (The Intelligence bureau) held a hurried conference to detect the source of the explosion and the place and people from the invading enemy if that was the cause. This had to be done quickly so as to assure our protective cover to the locals who were quite afraid of the Chinese mighty onslaught. Whereas the majority of our Armed Forces took position to effectively face the possible attack, some of us officers decided to crawl up to different positions away from our hideouts for a recee to pinpoint the source and cause of the explosion. One of my junior officer and I crawled up the hill MSP camp location. There were no lights as during “stand to” all lights are switched off. Much to our astonishment we heard some of the MSP jawans crying. We saw a small crowd that had gathered around 3 bodies who were killed in the blast. After we ascertained that the source of the explosion was in the MSP camp and not due to the enemy, the “stand to” positions were called off!! All the men heaved a sigh of relief to find that the enemy was not involved!! Yet, our job was not over as we had to find out the cause of the incident, it came to light that 2 jawans went out to the dropping zone in that evening and found a curious object. They brought it to their barracks. Thinking it will serve well as a paper weight they tried to tinker with it with a knife and there was a big explosion killing both of them on the spot and piercing the neck of the 3rd jawan who was quietly sleeping in his cot. Apart from the loss of 3 lives a large portion of the barrack was damaged. We found a piece of HEAT shell near the explosion site, that coupled with knowledge of the people who saw the curious object we established that the object that was found was Heavy Explosive Anti Tank( HEAT) shell of the Indian Army had exploded. The shell is powerful enough to knock down a Tank and could have easily killed more people. While paying tributes to the 3 men we thanked the Almighty for sparing our lives in that fateful day. As penned by Shri. S.V. Potdar. Food in Arunachal Pradesh is simple and scrumptious and they avoid the use of oil and masala. The use of herbs the medicinal properties are well known and practiced by the people. Rice is the staple food of all the tribe’s of Arunachal Pradesh. Dung Po (Steam Rice) is the most popular version of cooking rice. Kholam is also another popular and unique process of cooking rice. In this method a bamboo tube is used instead of metal utensils. Chicken, fish and herbs with rice naturally you are bound to be healthy. 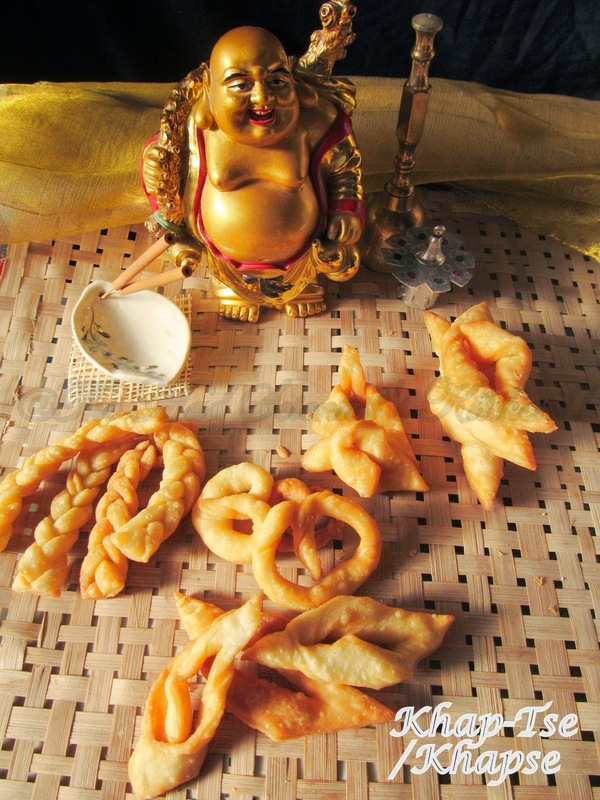 The people around the Tibetan New year also called Losar these biscuits are made. 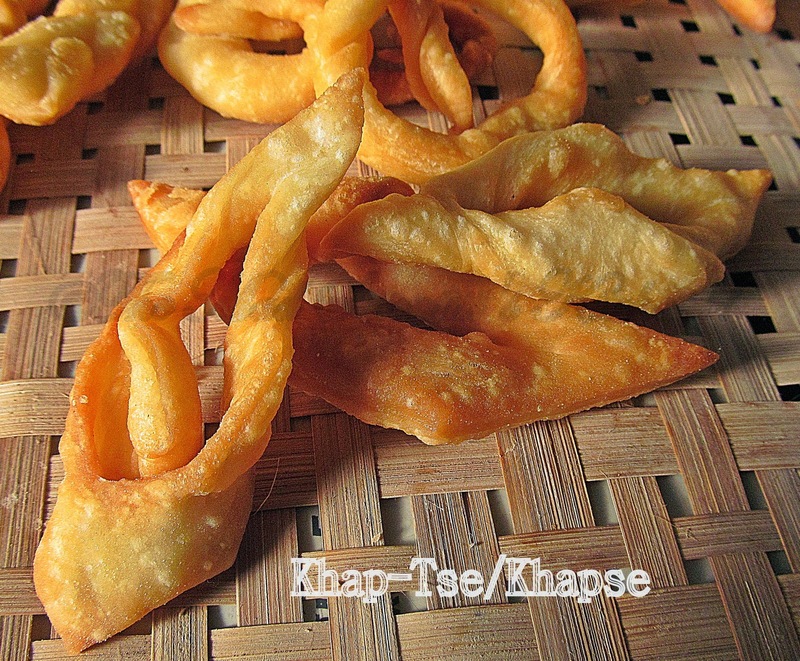 The biscuits are called Khap-Tse meaning fruit of one’s hands. These biscuits are offered to friends and family. It’s actually a joint effort apparently the dough is kneaded by men and the intricate shapes and designs are made by the women. I have given the exact measures but I have halved the recipe. Dissolve the sugar in one cup of warm water. Mix the flour, oil, salt and milk. Add the warm water and mix to form dough. The dough should not be too loose or tight. Knead well about 10 minutes. Make big balls and using little flour roll out the dough to about ¼ inch thickness. Remember Too little flour will cause the dough to stick and too much of flour will help your biscuits soak up a lot of oil while frying plus you will be left with a dirty residue at the bottom of your kadhai/wok . Cut the rolled out dough in strips with the pizza cutter then cut them again to form diamonds. Make a cut in the middle of the diamond. Now pull one end of the diamond through the slot. This will create a twist. The two ends need to be pulled a bit to even out the shape. (I missed this part).Now you are ready to deep fry your Khap-tse. Heat enough oil in a kadhai/wok (I used less than 250 ml as I find it easier to add more oil if needed and I am not left with lot of oil that I need to discard). When the oil is hot, to test drop a small piece of the dough in the oil. If it rises to the top immediately your oil is too hot, cool it. If the dough sinks it’s too cold, wait till the oil heats up. But if the dough sinks and slowly rises you are at the right temperature. Deep fry. Wait first lower the flame, it should be at the minimum, add a few pieces of the shaped dough which by the way is shaped in the form called nyapsha and I could easily add 4 big pieces. They should dip in the oil completely the oil bubbles around them. Stir them with a slotted spoon. Flip them over and fry till they are e light brown on both sides. They cook fast so be careful. Transfer them to a colander. This is what my mum used to do and she never used paper of any sort. You can drain on a tissue or kitchen paper. When they cool transfer to an air tight tin. You can sprinkle powdered sugar if you feel like. I wanted it but the girls and hubby were okay with them as they were. Khapse look soo crunchy and inviting ! and I like the laughing Buddha a lot :-)) nice prop, Archana ! oh that Buddha statue looks so apt!!! delicious fried ones!! wow ..what a write up...this must have been uncles life time experience...I was trying to visualize the scene..it seems a film scene..a midst this I cannot miss the beautiful crunchy Khapse....super one. Such wartime stories are always scary and serve as reminder to all of us how our armed forces serve at risky locations to defend our country! Hats off to them. Our thanks to your FL for sharing his experience with us. Those crunchy munchies look awesome..love the braided one. 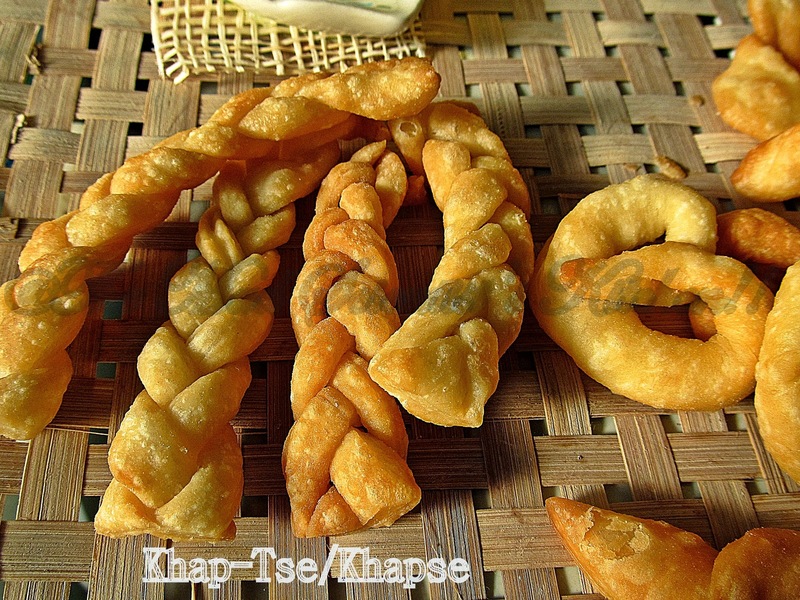 omg khapse looks super crispy and delicious :) I wud love to grab some right away :) lovely braid done .. are too delicious !! and lovely click !! Khapse looks cute & especially the braided one's are amazing. Nice write up dear!! enjoyed reading it and khapse looks great!! I had commented earlier but forgot to mention that the narrative of ur FIL was so good, seemed like watching a movie.. Special thanks for him to take time off to do this..
That excerpt gave an insight into the lives of armed personnel once stationed in NE indian regions. Loved reading it. Loved the shapes you made with thosee khapse. each one looks gorgeous.